There were several factors as to why Boston Bruins General Manager Peter Chiarelli re-signed Daniel Paille, Gregory Campbell and Shawn Thornton to new contracts before the fourth-line trio hit free agency this past season. On Friday night, it seemed like almost each of those reasons were on full display. 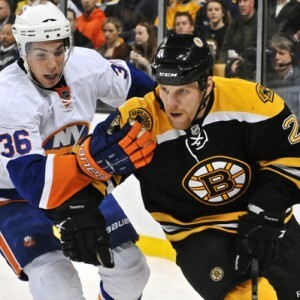 The Bruins skated to a 4-2 win over the New York Islanders on Friday night at the TD Garden, largely in part to the effort put forward by the team’s so-called Merlot line. Boston seemed slow to start but picked up momentum with three unanswered goals after falling behind 2-1. The fourth line was responsible for changing the direction of the game. While garbage goals aren’t exactly the prettiest way to score, it’s almost too cliched that they were how the grinding, blue-collar fourth-line put the Bruins on the board. Thornton opened up the scoring in the first period, stuffing a rebound from a Dougie Hamilton shot off of the point past Rick DiPietro. “(Thornton’s) a guy that will do anything for us to get on the board,” said Campbell. The Islanders pulled ahead after Waltham, MA native Keith Aucoin potted two straight goals but the Bruins tied the game in the second period after another garbage goal, this time from Campbell, who was on the doorstep to bury a David Krejci rebound. Paille and Thornton finished with a point apiece while Campbell ended the game as the team’s top scorer after adding his goal and an assist. The fourth-line’s offensive production didn’t go unnoticed from their teammates either. The camaraderie between the trio really shined through after Thornton came to the rescue of Paille who was about to drop the gloves with Matt Martin. Thornton received a ten-minute misconduct for his supposed heroics, while Martin was given a double-minor for unsportsmanlike conduct and Paille, a minor. “Everyone is used to seeing that from (Thornton),” said Campbell. “He has a tough job and everyone in here respects him tremendously. I think it goes without saying on this team, to have each others’ back. On Paille, it was a clean hit. I guess it’s part of the game. I guess team toughness is an important aspect of a hockey team. The win gives the Bruins a 3-0-1 record one week into the shortened 48-game NHL season, good enough for tops in the Eastern Conference for now. Next up, the Bruins will travel to Carolina to play the Hurricanes on Monday night.